Outstanding views of Whitefish Mountain Resort can be seen from nearly every window in this private ski mountain retreat. The home is located in a private community in the ski village. Groomed ski trails and a homeowner’s ski lift provide ski access to the resort. In summer ski trails turn into endless hiking and mountain biking trails you can access right from your front door. The location, superb recreation opportunities and comfort this home has to offer make it the ideal vacation retreat for your family. The home has over 2000 square feet of tastefully appointed living space featuring two master bedrooms with en suites. One with large separate soaking tub and the other with combination shower/tub – each with double sink vanities. A balcony off the upstairs suite gives outstanding views of the ski resort and mountains in the valley. A sleeping loft has space for games and watching TV as well as two twin beds. A third bathroom with shower on the main level ensures that each sleeping space has its own private bathroom. Each room has its own flat screen TV and DVD player (4 total in the home). A large kitchen is well equipped to cook simple or gourmet as you choose. The living room has a beautiful wood-burning fireplace with large windows that bring the outside landscape right into the home. The owners have a private wing off the back of the house. The property managers live on site in a separate walkout caretaker’s quarters and will ensure your stay is comfortable and convenient. There is expansive outdoor living space featuring wrap around covered decks, which once again give outstanding views of the mountain. An outdoor fireplace provides a great place to gather for outdoor meals or relaxing after a long hike in the park. Common area surrounds the home along with a double lot, which gives the home and outdoor area a very private feel. The surroundings of the home are beautifully landscaped with several areas to relax and enjoy the views. A trail leads from the deck just steps to the homeowner’s ski run, which provides a great place to start a day of skiing, hiking or mountain biking. If you are visiting during huckleberry season you will find several great patches for picking either on the property itself or up the mountain. Other summer activities include scenic gondola rides to the summit, zip lines, canopy tours and the alpine slide. Other nearby winter adventures include snow cat powder skiing, snowmobile tours, groomed cross-country skiing and snowshoe trails, dog sled tours and ice-skating. In addition to all that Whitefish Mountain Resort has to offer, Glacier National Park is less than an hour away with its unparalleled beauty and recreation opportunities. The Valley also has several outstanding golf courses and two large lakes (Whitefish and Flathead Lakes) along with multiple rivers, which provide opportunity for water sports, rafting and fishing. Glacier Park International Airport is only 30 minutes away making travel convenient. Downhill and cross-country skiing, snowshoeing, hiking, mountain biking, zip-lines, alpine slide, and much more. Easy access to shops and restaurants within walking distance in the Whitefish Mountain Resort village. Amazing views of Big Mountain from nearly every window. Homeowners lift, requires crossing one road and can ski right to door. Groomed homeowners ski trail just steps from door, fairly flat for 300 yards to main ski trail. radiant floor heat on main floor, gas stove and baseboard on second floor. Great views of Whitefish Mountain Resort, woodburning fireplace, flatscreen TV. Large and well equipped with two sinks, 5 burner gas cooktop, double wall oven, eat in bar. Dining table seats 6. Additional seating for 3-4 at eat in bar in kitchen. Off upstairs master with great views. Expansive outdoor covered decks off main floor with outdoor fireplace. Perfect for 2 couples, but accommodates 6 guests comfortably. Access to home is on second level which requires walking up a flight of stone steps outside. The home has three levels - the first level is the caretaker's apartment, the second and third level are the vacation rental. The driveway is short, but moderately steep - about 16% grade (9 degrees). Fairly flat area to park at top. AWD recommended in the winter. We stayed at Katahdin Chalet for a ski holiday in February 2019 with our 17-year old daughter and her 16-year old friend. The property itself is outstanding: beautifully built and tastefully decorated, comfortable, cozy, with breathtaking views all around the house. One of the best-stocked, huge kitchen where we spent lots of time together cooking, chatting, eating. Love the open concept of the main floor: enjoy a roaring fire in the hearth after a chilly day of skiing, or just over a short lunch break. It's hard to leave a place like this to hit the slopes again! The pictures shown on VRBO are very accurate, which is always appreciated. There is nothing like having dotting care takers living downstairs: while being responsive, their respect for privacy is superb and much appreciated. Everything is well taken care of, from snow removal to answering questions and providing last minute extras. Since we were buried in powder for over 3 days, it was more a slow walk from the house to the ski hill (instead of skating more quickly on hard pack) - but we certainly didn't mind! On the way back home, don't miss taking the 2-seater chair that will take you above the neighbourhood, allowing you to ski down effortlessly to the chalet. All well-explained in the welcome letter before your arrival. Outstanding accommodation, outstanding comfort, outstanding views, outstanding service: could not have asked for more outstandings! Wonderful location and great skiing! We had an awesome week in Whitefish! The home, the snow, the view, Nick & Bethany - everything was perfect! The family voted Whitefish our top ski trip in the U.S. to date. My family of 5, kids 13, 10 and 7, couldn’t imagine a better home to spend a week in MT. The house is beautifully appointed, comfortable, breathtaking views, and the on site managers are wonderful, attentive and invisible if privacy is what you want. Great location and easy access to Whitefish. We’re definitely returning. 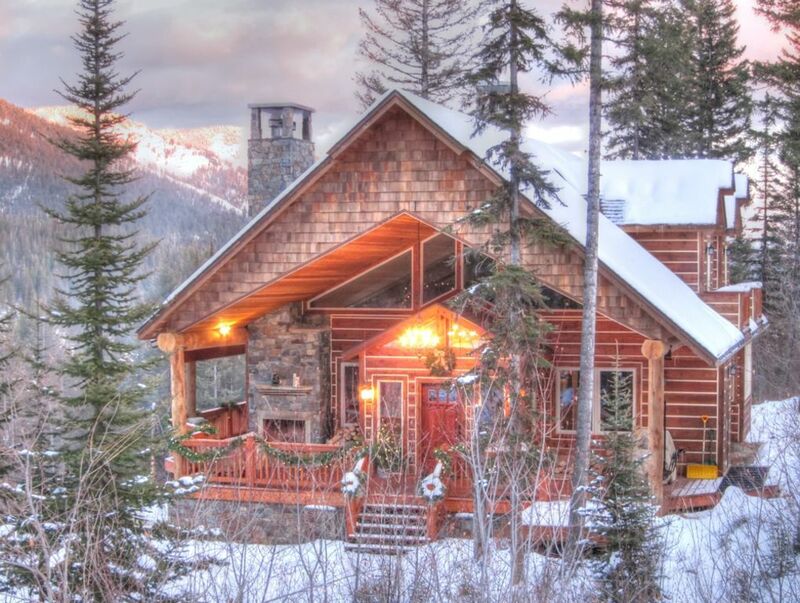 Perched high above Whitefish, this cozy home looks out at the ski runs dotting Big Mountain. It is a wonderful place to just hang-out, as well as a perfect place from which to launch adventures. The West Glacier entrance to GNP is 45 minutes away...while some of the best National Forest Service trails, e.g., Jewel Basin, are accessible within an hour. The Danny On, a very popular day hike launches from a few blocks away. When you are ready for a night out, Whitefish has a great deal to offer in terms of fun restaurants. Nothing is more than 15 minutes away...and you will be pleasantly surprised by how great the food is at such places as Ciao Mamba. If you plan to dine in, there are two excellent grocery stores in Whitefish...and a well-equipped kitchen in the home. We had everything we needed at our finger-tips. We've stayed in hundreds of homes, hotels, and resorts throughout the world...and this property ranks very high on our list of favorites! We will be back...soon! Finally, a note of thanks to Nick and Bethany for taking good care of us during our stay. They get an A+ for responsiveness to our requests! PS: Next time we will invite another couple to join us. There's plenty of room, as well as privacy. The home could easily accommodate a family of six (perhaps more). We stayed at the Katahdin Chalet for one week in June, 2018 and wish it could have been longer. The home is beautiful and very comfortable. The kitchen had all we needed for the few meals we prepared. We definitely enjoyed the view from the deck and porch area. We would recommend Katahdin Chalet if you are looking for a nice quiet place to spend some quality time. We appreciated all the attention the host provided, we thought the accommodations were top notch and enjoyed all the amenities available in the house. Fire wood allotment could have been a bit more. Overall very good. Until confirmed, rates subject to change without notice. If the home requires additional cleaning due to excessive wear and tear during your rental stay, it will be deducted from the $500.00 deposit. CANCELLATION POLICY: If cancelled more than 60 days prior to check in the initial 50% deposit will be refunded less a 25% processing fee. If cancelled 30-60 days prior to check-in the original deposit is non-refundable. If cancelled less than 30 days before check-in there is no refund except the security deposit. If you have any questions please contact us.